Crystal Palace rounded off their rollercoaster festive fixture period with an impressive 2-0 win away at Wolves, who have now lost five of their last seven at the Molineux despite making their home ground a fortress early on in the campaign. After a gritty 1-0 victory over Leicester without the influential Wilfried Zaha was followed by a spectacular three points at Manchester City, fans were surely furious when the next two games bore no goals and just one point for the Croydon outfit so Wednesday’s win couldn’t have been more timely. Roy Hodgson’s deplorable decision to, yet again, leave Max Meyer on the bench was proved effective as the man who he most likely replaces in the lineup, Jordan Ayew, netted an 83rd-minute opener for Luka Milivojevic to build upon from the spot in the dying minutes. The Ghanaian hitman has been subject to heavy criticism since his arrival on loan from Swansea in the summer – a versatile forward, the 28-year-old was surely brought in to put the ball in the back of the net but Palace fans have had to wait until 21 games into the season to see him get on the scoresheet. Most will likely only care about the fact that the former Aston Villa man scored his side’s crucial goal last night but, aside from the fact that the finish was superb and the touch that preceded it equally so, his all-round game was commendable as he put in his best performance in red and blue yet. His contribution to the attack may have left much to be desired until this week’s trip to the Midlands, but the loanee cannot be pulled up on his work-rate or willingness to track back and his performance versus Nuno Espirito Santo’s men was no exception; he completed a remarkable 5 tackles as he worked tirelessly out of possession. The 48 cap international’s reintroduction to the starting XI allowed Hodgson’s makeshift strike partnership of Zaha and Andros Townsend to return to their natural positions on the wing and all three linked up exceptionally well, as shown by Ayew’s 3 key passes – his best this season. Palace have been crying out for a physical presence up top in the absence of Christian Benteke and, while he may not be of the big Belgian’s stature, Ayew imposed himself on the Wolves defence nonetheless as he won 1 aerial duel – it should be noted, however, that crosses and long-balls are a rarity in Hodgson’s system. Showing glimpses of the drive he showed with the ball at his feet during his time at the Liberty Stadium, the Marseille-born striker completed 3 dribbles and his current teammates will be hoping he continues to show this kind of verve going forward. 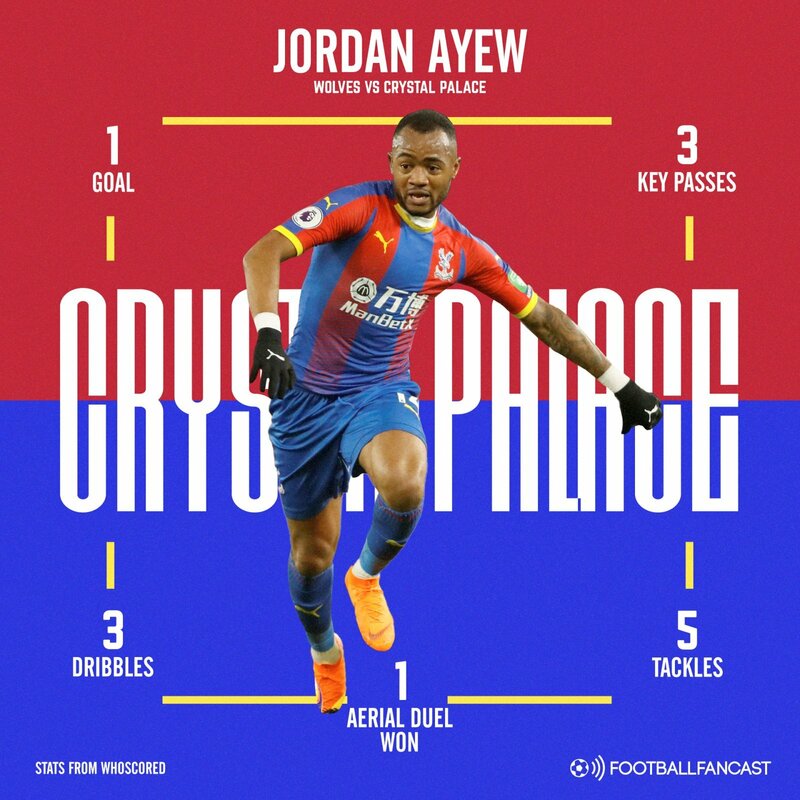 The Selhurst Park outfit have seen their recent swoop for a new striker fall through and, if they cannot identify another realistic target, Ayew may be their best option for the remainder of the season – they will be hoping this is the start of an excellent run of form for their number 14.